It's been several months since I last posted something. My bad - I need to post more regularly. In the meantime I've been busy. I have a new bench for hot work now. Much better than the make-do I was working with. It's a Harbor Freight special, but it has a nice wide surface, drawers and pegboard storage, lighting, and a lower shelf for extras. I'll be able to safety-chain the acetylene tank to the leg. The whole bench frame is metal so I can use magnets to add features. 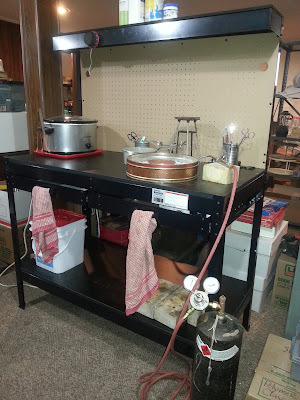 That round thing on the overhead shelf is a magnetic stick-on timer so I can put something in the pickle pot or other solution and have it tell me when it's ready to come out. There's also two new vessel projects in the works. These are the first in a style I'm calling Elsewhen Antiquities. First is a piece in thin (22 gauge) copper. Unfortunately, I don't have any pictures of the earliest stages. It's being done in high relief. 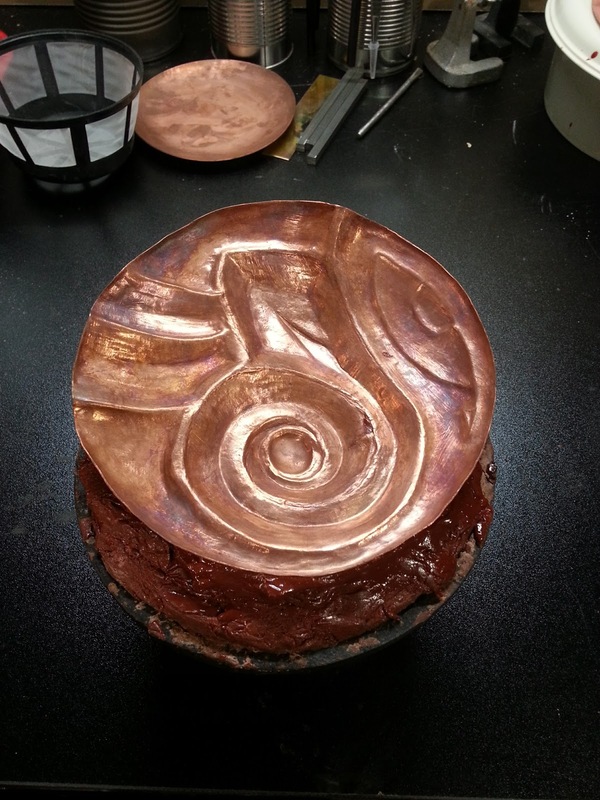 Right now it's on the second pass of repousse. 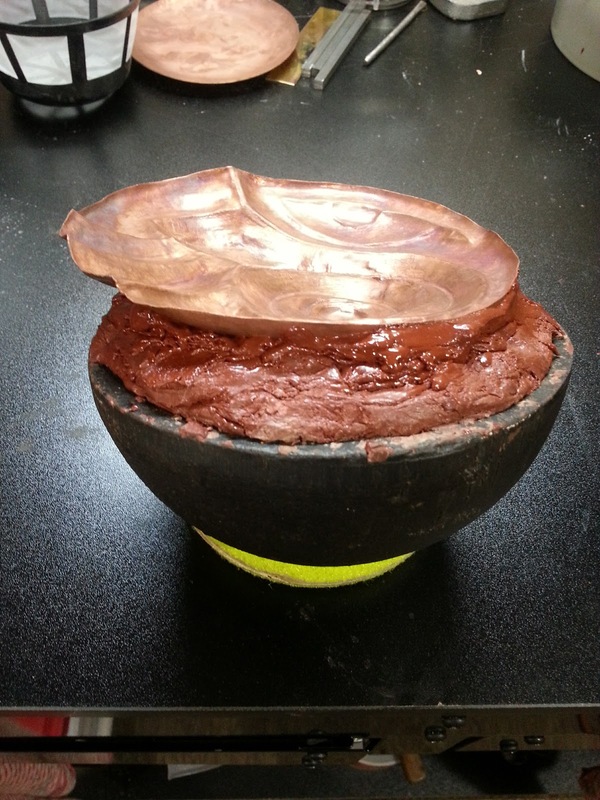 The initial stage was dishing to make a smooth, shallow bowl. The design was drawn on freehand and the basic lines put in with chasing tools. I filled the bowl with red sculptor's wax for this stage. 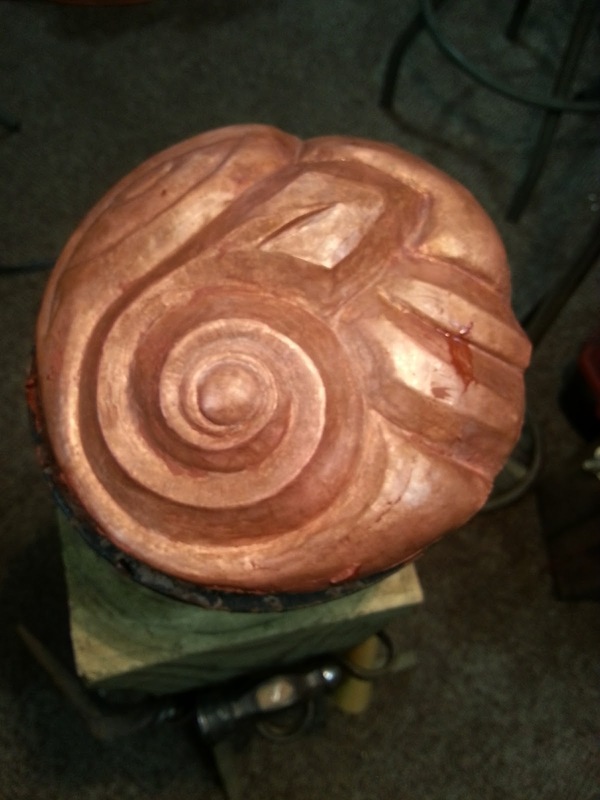 Some of the larger shapes were simply hammered into place, no chasing tools needed. That speeds things up. I did manage to poke a hole in one spot while I was trying to deepen the major spiral of the piece. 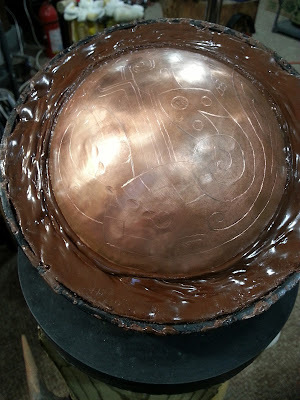 I'll solder that closed when I've finished this repousse pass. For now, I'm just avoiding that spot. In place on the pitch bowl. Not all of the piece is supported, so I need to be careful where I work. But this way I can use the pitch bowl to advantage in tilting the piece and I don't need a pitch bowl bigger than the piece I'm working on. That's good because I only have one large pitch bowl and it's got the second piece on it. Top view before the second pass. My intention is to sharpen up the lines that form the crests and valleys of the shapes. After the second pass of repousse. See how much crisper the lines are? Front side of the piece after I popped it off the pitch. 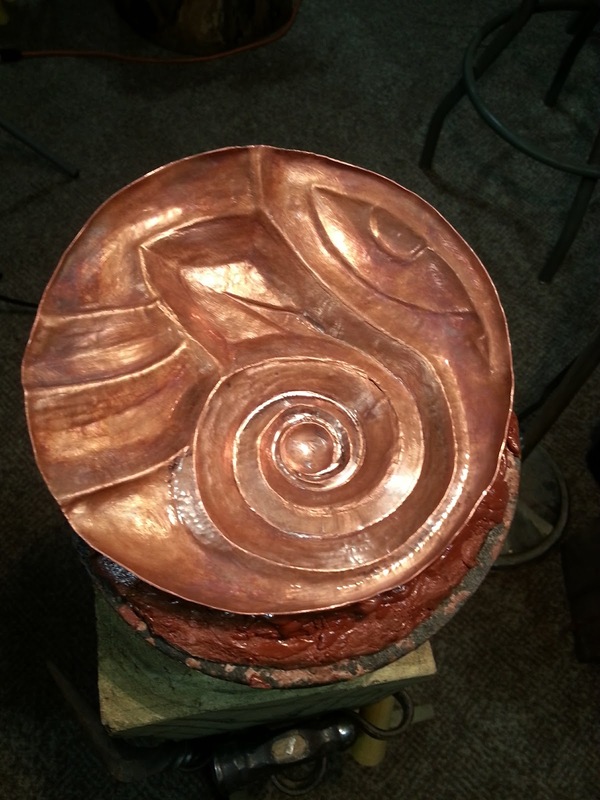 The second piece is in 18 gauge copper and will be done in lower relief. Here it is after being dished and having the design drawn in Sharpie. 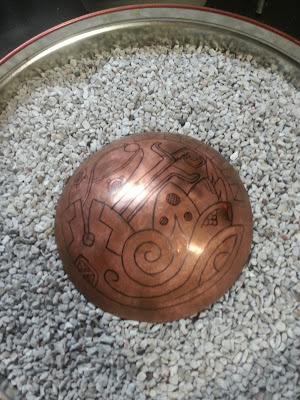 And here it is after I've scratched the design in with a scribe and set it into my large pitch bowl. Scratching the design in makes it fairly permanent. The Sharpie would have worn off of before I got the whole thing lined in with chasing tools for the first pass of chasing. Pencil is no better. The scribe lines are harder to see, but they don't rub off and they're narrow, so I have a very clear idea where the chasing tool is supposed to go.